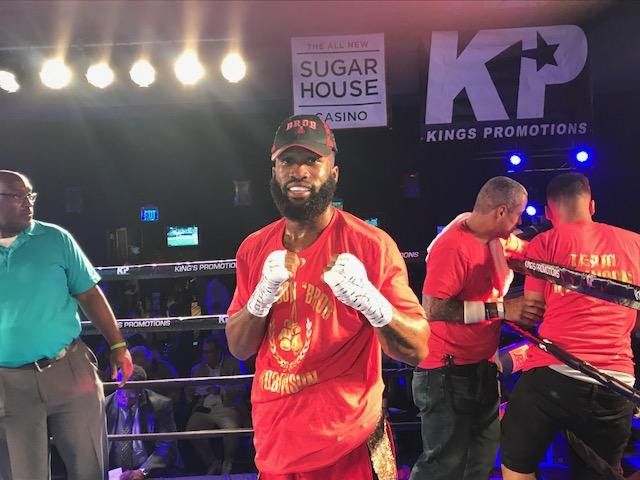 Rising super middleweight Brandon Robinson is gearing up for his maiden headlining appearance when he takes on veteran Oscar Riojas in a eight-round bout on Friday, April 6th at The 2300 Arena in Philadelphia. The 9 bout show is promoted by King’s Promotions. Robinson (9-1, 7 KOs) has been on a roll as he he has won his last nine bouts in a row, and is getting better with each performance. The 29 year-old has paid his dues, and has worked his way up the card. “It feels great to headline. It is a very humbling experience, especially after losing my pro debut, and then being on the bottom of the card. It drives me,” said Robinson. In Riojas, he is facing a 25-fight veteran, who has faced six-undefeated opponents. Robinson feels he is just now coming into his own, and his best boxing is yet to come. In the eight-round co-feature, former world title challenger Jose Gonzalez (24-2, 19 KOs) of Toa Baja, PR will take on an opponent to be named in a super lightweight bout. It will be an eight-round battle of undefeated super bantamweights when Marcus Bates (8-0-1, 7 KOs) of Washington, DC will fight Raeese Aleem (10-0, 5 KOs) of Las Vegas, NV. Also in a six-round bout, Steven Ortiz (8-0, 3 KOs) of Philadelphia will see action against an opponent to be named in a lightweight battle. Colby Madison (6-0-1, 4 KOs) of Philadelphia fights Guillermo Del Rio (2-2, 2 KOs) of South Houston, TX in a six-round heavyweight battle. Joshaphat Ortiz (2-0, 1 KO) of Reading, PA fights Evgueny Metchenov (0-1) of Forestville, MD in a junior light bout scheduled for four rounds. Poindexter Knight (2-0, 2 KOs) fights Vincent Floyd (3-4-1, 2 KOs) in a battle of Philadelphia based welterweights. Rasheed Johnson (3-1, 1 KO) of Philadelphia fights Denis Okoth (1-0-1, 1 KO) of Siaya, KE in a welterweight bout. Kendall Cannida (1-0) of Philadelphia boxes pro debuting Carlos Villenueva of Philadelphia in a light heavyweight tussle.